Home > Safety > How Safe are Inflatable Toys? Inflatable toys are great fun and usually prove a major hit with young children - who get hours of fun from bashing each other over the head with them and generally having a great time. But there are things that affect inflatable toy safety and it’s worth being aware of those before you buy an inflatable toy for your children. What Are Phthalates And Why Do They Matter? Phthalates are a family of chemicals that are used as plastic softeners. They can be absorbed through the skin, inhaled as fumes, or even ingested through food or when children chew on their toys. It’s for this reason that phthalates are an issue for any parent wanting to buy inflatable toys for their kids. 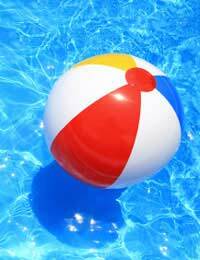 Inflatable toys and other swimming pool toys are often chewed and put in the mouth by little children. Because of this, inflatable toy safety is paramount and there are rules governing inflatable safety which include the phthalates directive restricting the use of these chemicals in any toy that can be placed in the mouth. Technically, phthalates should not be present in any toy or part of a toy which can enter a child’s mouth cavity “in such a way that a substantive area of plastic material may be chewed and sucked with a high degree of comfort and ease giving rise to prolonged periods of mouthing.” So any inflatable toy that you give to your child should be free from phthalates, especially if it’s marketed to under threes who are well known for putting inflatable toys in their mouths along with anything else they can find! Many toys and inflatables are designed to be used under the supervision of an adult, and inflatable toys usually carry the ‘under supervision’ warning label. The amount of supervision that your children will need when playing with inflatable toys varies depending on the age of the children and the type of inflatable they are playing with, but really big swimming pool toys and inflatables which can fill with water are also a hygiene risk so as a parent you’ll probably want to keep an eye on the children just to make sure they aren’t getting mouthfuls of old dirty pool water too! Check the warning labels for inflatable safety instructions, and age recommendations. Always choose toys that suit the age and abilities of the child you are buying the toy for. Avoid small parts on toys intended for children who still chew everything in sight. Check how the toy is made before you buy it. If there are any attached parts they should be secured. Seams in inflatable toys also need to be tight. Check that any toys which contain sand or other materials don’t leak. Check all the seals, plugs, and seams on the toys for leaks, and look for any for holes. A deflating toy may cause suffocation or choking accidents. Check the edges of the toys and make sure that they haven’t become exposed on hard plastic toys such as diving sticks. Children can hurt themselves on rough plastic edges. Always make sure there is no mould or mildew growing on toys that have been stored for some time. Mould and mildew can make asthma and allergies worse. Obviously you need to keep an eye on your children while they are playing with their toys. Watch the swimming pool toys to make sure they do not deflate while in use, and warn the children not to play with any broken toys you spot. After the pool party, have a quick look at the inflatable toys before you put them away, and store them where they can dry properly to prevent the growth of mould or mildew.